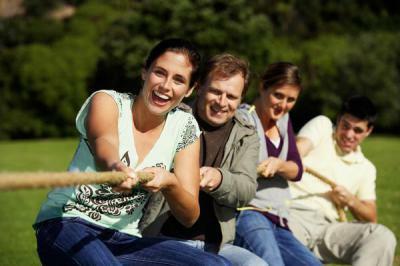 Corporate team building events are an excellent tool for motivation and communication in any working environment. Team building encourages participation and concentration levels between colleagues, and have a proven record of increasing inter-office bonding. Whether you are looking to host a School Sports day or a Crystal Maze challenge, Richmond Athletic Ground’s 26 acre site is the perfect location. With ample outdoor space in the heart of the London borough, you are unlikely to find a venue as centrally located with as much freedom to entertain as us. Our indoor bar areas can be set up for a morning conference while the event organisers plug in the inflatables outdoors for an afternoon of problem solving and team bonding. All washed down with a few rounds of Pimm’s and a BBQ at sunset to end the festivities. Venue hire comes with free car parking for all delegates, and Richmond train station is just 5 minutes away on foot where services run from the District Line, National Rail and London Overground. You can even bring a coach to park at the ground if you need to. 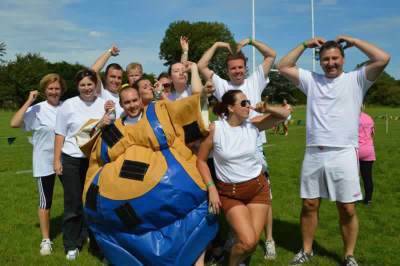 We have many regular events companies who work with us to organise the day, including the lovely team at Knockout Challenge and Gable Events who have a huge variety of activities to choose from.